The view from the Charles Bridge of the St. Vitus Cathedral in background. Here you can watch swans drifting along with steam boats on the river. Photo by Alexis Tucker. GRAFENWOEHR, Germany — If you haven’t been drawn into the bustling city of Prague yet, get ready to be mesmerized by the elaborate architecture. Although the city can be touristy at times, it still maintains its charm and romantic appearance. With architecture that varies between Gothic, Renaissance, and Baroque it will draw you in. Flock to the old city to watch the oldest still functioning astronomical clock. Pay close attention as it chimes on every hour and the figures are set into motion. Take a look at the Tyn Cathedral to your right and get knocked off of your feet when you realize that the two spires of the church are not actually symmetrical. This gothic architecture style of the spires represents the masculine and feminine sides of the world. Once the clock has come to a rest, trot down the cobblestone streets towards the Charles Bridge. Before reaching the bridge grab a tredelniki, a cinnamon pastry that resembles a donut. They are located in two cafes along the road that lead you to the bridge. You can get them lined with Nutella and filled with ice cream, fruit, or whipped cream. These treats are often featured on Pinterest and Instagram and can make anyone with a sweet tooth envious. Eat your dessert and watch as street performers wow you with tricks of levitation. Try to visit the Charles Bridge when the sun is rising and stretching out across the river or when the crowds have disappeared, leaving the night illuminating the bridge with a new perspective. At these times you can better absorb the details of the majestic statues. On the way back to the Old Town, head toward Kampa, a neighborhood located by the river. Grab a bite at The John Lennon Restaurant and visit the John Lennon Wall. The wall has been painted in graffiti since the 1980’s and is a symbol of peace to this day. 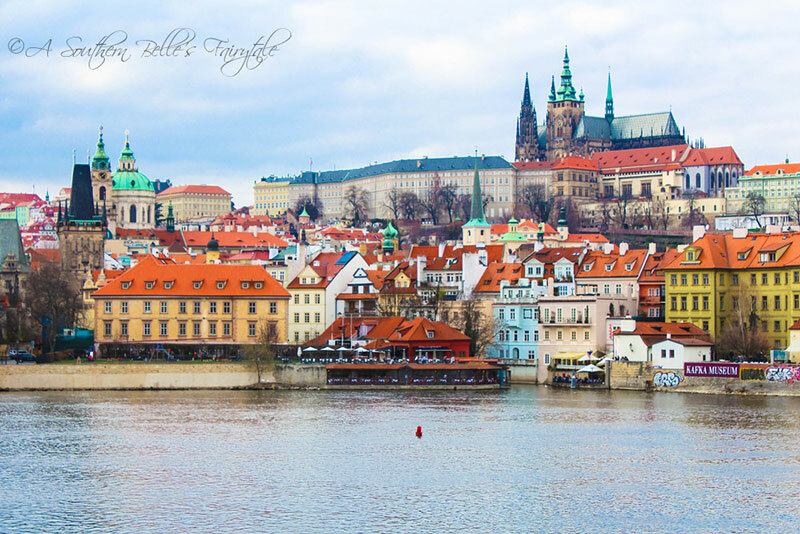 There is so much more that Prague has to offer. No matter where Prague’s winding alleyways lead you, I can assure you that you won’t leave disappointed. Travelers beware. Local newspapers in Germany report that fraudsters in Prague have been kidnapping license plates. Victims are left a phone number to call to get their plate back, but at a hefty price. If this happens to you, immediately contact authorities or notify your hotel management. Editor’s note: Alexis Tucker is an Army spouse and a member of the USAG Bavaria community. She writes a travel blog at http://asouthernbellesfairytale.weebly.com. This article was published with her permission.